Introduction: Mary Harrell-Sesniak is a genealogist, author and editor with a strong technology background. In this guest blog post, Mary gives examples of how your ancestors’ diaries and journals—some available online in various collections—are invaluable to your family history research. As family historians, we turn to newspapers to corroborate vital records—but often neglect to venture further with our research by exploring charming, firsthand accounts from our ancestors’ diaries and journals. Not only do these personal writings add to the fabric of our research, they enrich genealogical studies by adding unique perspectives into specific time periods, activities and historical events. Some entries from diaries and journals, as well as complete autobiographies and memoirs, can be found in GenealogyBank’s Historical Book Archives, and others appear as feature pages in GenealogyBank’s Historical Newspaper Archives. 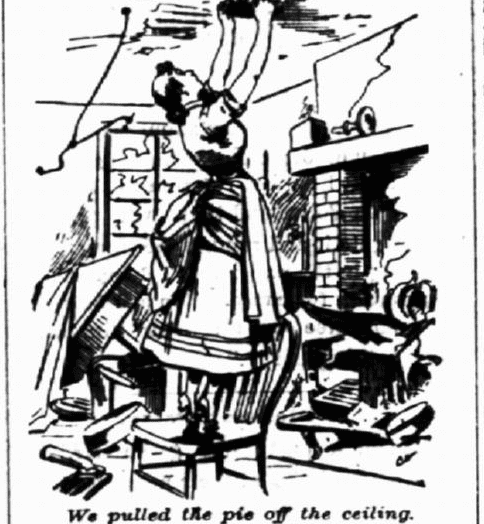 I think you’ll enjoy reading some old-time intimate diaries. The excerpts I’ve chosen from diaries found online present a variety of stories. Two are from brides, one is about shipwreck and imprisonment, another is about young school boys who get in trouble writing diaries, and the last is a description of the First Battle of the Marne during World War I. 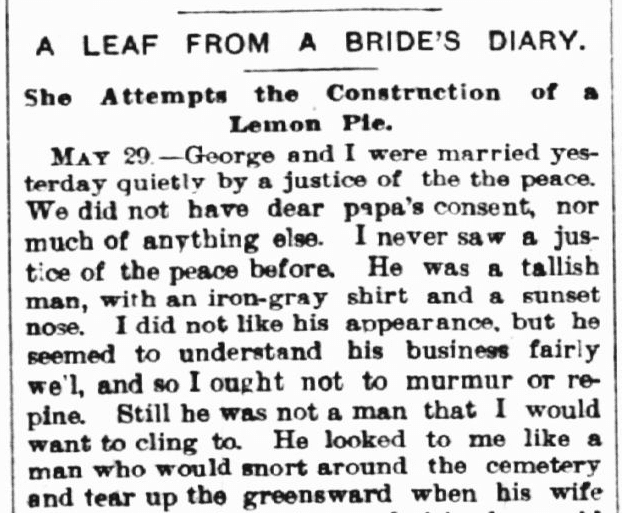 This 1886 article from an Illinois newspaper presents “A Leaf from a Bride’s Diary.” In her witty and entertaining diary entries, this bride recounts the story of her elopement, her impression of the justice of the peace, and her hilariously failed attempt at baking her first pie. We did not have dear papa’s consent, nor much of anything else. He looked to me like a man who would snort around the cemetery and tear up the greensward when his wife died in the early spring, and friends would have to chain him to a tree somewhere till his grief had spent itself, and then in the early fall he would lower the top of his old concertina plug hat, and marry a red-eyed widow with a baritone voice and two sons in the penitentiary. To-day I am a wife with my joyous girlhood, my happy home and the justice of the peace behind me. Life is now real, life is earnest, for we have no girl [servant]. We will not keep a girl at first, George says, for if we did she would have to board at home, as we have only one room, and it is not a very good room either. We take our meals at a restaurant, and the bill of fare is very good. While thus engaged the oven door was blown off the hinges and the air was filled with subtle odor of some kind which I could not describe. We pulled the pie off the ceiling. 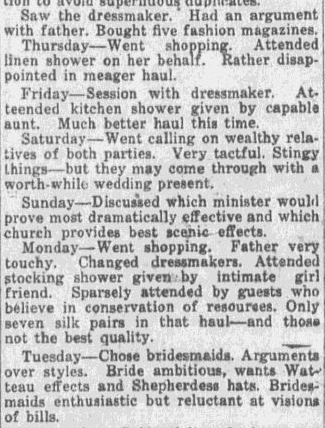 While perusing this next perfunctory diary, take note that some brides are more interested in the “haul” of their shower and wedding gifts than the feelings of friends and family, and that wedding planning has always had its challenges! The Diary of Donald Campbell (1751-1804) was first published in 1795 and, due to its popularity, republished several times. Follow Campbell’s fascinating story of a journey to India, where he was shipwrecked and imprisoned. Luckily, Campbell was released and wrote his story for us to enjoy centuries later. Historical book: “A Narrative of the Extraordinary Adventures, and Sufferings by Shipwreck & Imprisonment, of Donald Campbell, Esq. of Barbreck. 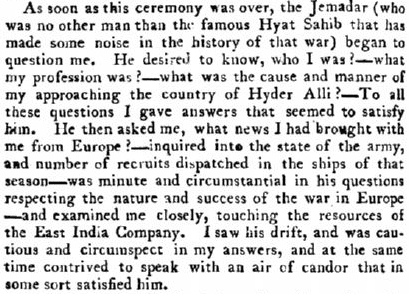 With the Singular Humors of His Tartar Guide, Hassan Artaz.” 1801 edition, page 260. For more information on Campbell, see: http://en.wikipedia.org/wiki/Donald_Campbell_(traveller). 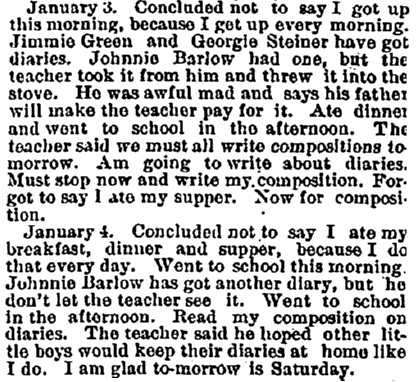 After receiving a diary from his Uncle Joe, Robert Cummings documented how his days passed. After a friend was caught writing in his diary at school, the frustrated teacher threw it into the fire—making this activity all the more desirous to these young diarists. January 1. This is New Year’s Day. Uncle Joe gave me this diary to-day. I am going to write in it every night just before going to bed. Every boy and girl ought to keep a diary so when he gets a man he can see what he did so when he was a boy. This is New Year’s Day, and there ain’t no school to-day, and I have played with Billy all day. Billy is my goat. I got up and ate breakfast, then I harnessed Billy and saw Uncle Joe and he gave me this diary. He says it is the best thing a boy can do to keep a diary, but he says it is the hardest thing a boy can do. I don’t see where the hard comes in. Although the author of this diary was only described as an unnamed “citizen of Crepy-en-Valois,” this gripping account from the French newspaper Petit Parisien was reprinted in papers across the world. For more information on the First Battle of the Marne, see: http://en.wikipedia.org/wiki/First_Battle_of_the_Marne. As you can see from these examples, diaries and journals provide an extraordinary glimpse into our ancestors’ lives, giving us details of their everyday experiences and, occasionally, insight into important events they participated in or witnessed firsthand. Dig in and find everything from great-great grandma’s first pie to war stories from the battlefield and beyond. Be sure to include these genealogical treasures in your family history research. True personal stories direct from your ancestors add more interest and meaning to your family tree. Please share reports of exciting diaries or journals you have located in your genealogy work—either within a personal family collection or online—in the comments section below. My great-grandfather kept a diary for his trip to Ecuador in 1901. I have transcribed it and put it online, with some commentary. Thank you for sharing the diary online. I did a search based upon your comment, and found the diary of Nathaniel McHorney. Sounds like the conditions on the boat were rather worrisome, as well as his finances. Very interesting to read about his journey. What an exciting find. Thank you for sharing this information, and also for sending the link about your blog. Hello, I wonder if you might be able to give me some tips on finding a diary or journal that I could use for a potential book project. I am not looking for family journals, but am instead interested in finding diaries/journals written by women who were victims of domestic violence throughout the history of the United States. I am looking only for works that I would be able to take excerpts from and publish as part of my book (I would cite my sources, of course.) 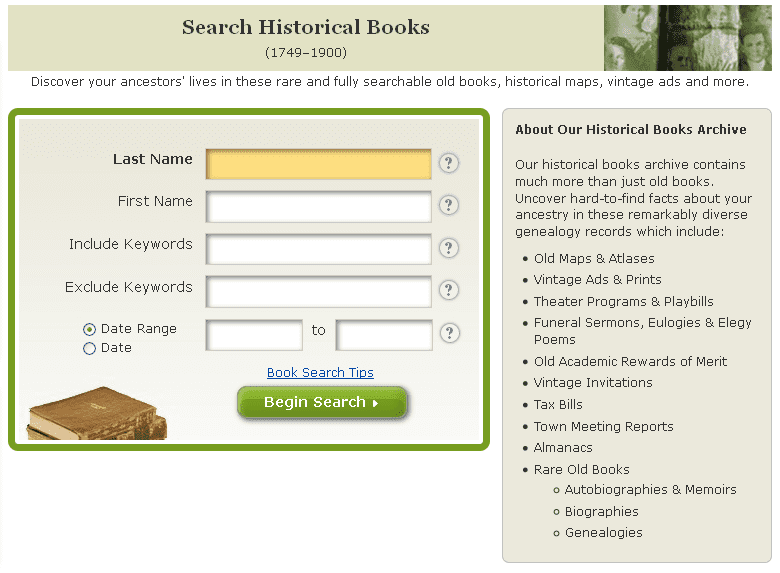 Do you know if there is any way to search for archived journals by type or subject matter rather than by family name? Your assistance would be much appreciated. Thanks! 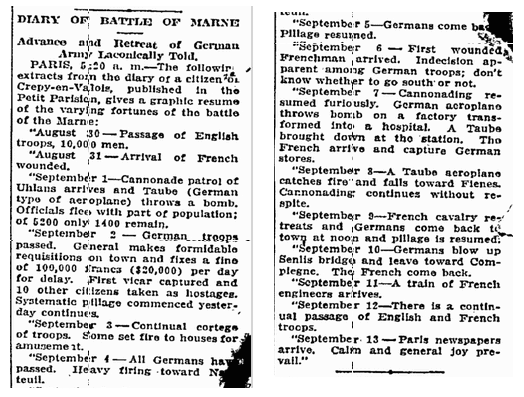 If you search in historical newspapers, or on the Web, incorporate keywords pertinent to the subject matter. Think about how a woman would express herself when faced with violence and add that to the search terms journal, diary or letter.